UBC-Point Grey is a district in the westside of Vancouver occupying a pretty spot at the tip of the Point Grey peninsula. 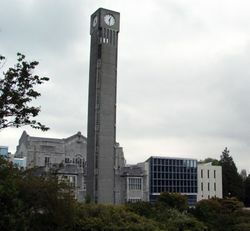 Its main occupant is the University of British Columbia (or UBC for short), the largest university in British Columbia and one of the larger universities in Canada. 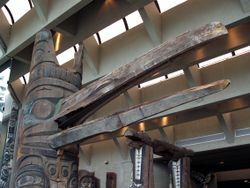 For the purposes of this guide, the district includes the university campus, Pacific Spirit Park and the neighbourhood of West Point Grey. The boundary follows Highbury St / 16th Ave / Pacific Spirit Park in the east, while to the west and south is Georgia Strait and to the north is Burrard Inlet. The main occupant of the University Endowment Lands is UBC. It includes not only the University, but also residential and commercial areas. The campus is surrounded by Pacific Spirit Park, a large nature reserve. 4 which connects UBC to downtown and Granville Island via West 4th Avenue. 14 travels along West Broadway/10th Ave and connects UBC, downtown and Gastown via Granville Street. 44 express via 4th Avenue which connects UBC to Waterfront Station downtown (connection to the SeaBus and North Vancouver). The fastest route between UBC and downtown but only operates on weekdays. 9 which travels up and down 10th Ave/West Broadway through Kitsilano, South Granville and East Van. Except during peak hours this bus normally terminates at West Broadway/Alma Street, requiring a connection on the 99 or 14 to continue to UBC. 25 which runs east/west along King Edward Avenue with a short detour along Dunbar Street continuing along 16th Ave into UBC. 33 runs east/west from 29th Avenue Station on the Expo Line, mostly on 33rd Avenue, Cambie, and 16th Avenue into UBC. 49 from Metrotown Station, along 49th Avenue to UBC. 480 travels along 41st Avenue and Granville making select stops between UBC and Richmond, terminating at Bridgeport Station on the Canada Line. This is also a weekday-only route; on weekends, take the Canada Line up to 41st Avenue and take a #41 from there. Bus fare costs $2.85 (if paying cash) from within Vancouver city boundaries. 4th Ave, 10th Ave/Broadway and 16th Ave are the main roads into UBC from Kitsilano. Marine Drive SW enters the district from Vancouver South and follows the coast around the campus. Chan Centre for the Performing Arts— A concert hall and events centre; often the location of convocation ceremonies. Jericho Beach is a more family oriented beach with a large picnicking area. The beach forms a crescent shape which creates a sheltered swimming area that is relatively shallow. In the summer, the beach is patrolled by life guards who monitor beach near the floating dock. 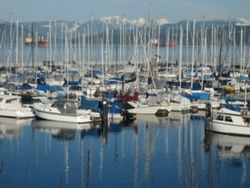 Jericho Beach is also a great location to go windsurfing or dingy sailing and is the location of the annual Vancouver Folk Music Festival. Nearby, bring some frisbees to try out the disc golf course at the Jericho Hill Centre (W 4th Ave & NW Marine Dr). Spanish Banks  is a set of three sandy beaches further west towards UBC. When the tide is out you can walk way out on the mudflats. This is a popular spot for skimboarders and kite boarders. The area has a large stretch of beach which makes for a popular beach volleyball area as well as a scenic multi-pathway system, connecting Jericho Beach to UBC, making a fine running or cycling course. A large field behind the beach has been designated as an off leash area for dogs and part of the beach as well. 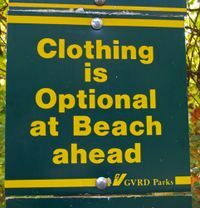 Wreck Beach— Probably North America's most famous and busiest clothing optional beach. The trail to Wreck beach is near the West Parkade, or more precisely at the extreme west end of University Boulevard just past the Place Vanier residences. You can either park on Marine Drive or you can take transit to UBC and continue down the same road the bus brought you on foot. The steep stairs are not recommended for the faint of heart. There is always a festive atmosphere at this beach and many types of goods are for sale from jewelry, to food, to beer. Watch out as the police do occasionally crack down on drug use and open consumption of alcohol. University Village has a number of service stores including a Staples office supply store, photocopying services, several restaurants (including a subterranean foodcourt), a grocery, coffee shops, a liquor store, a newsstand, etc. Point Grey's main strip is along West 10th Avenue where most of the restaurants and small shops are located. Vancouver is famous for its love for Japanese food, and Point Grey reflects this with no less than three Japanese restaurants within a few blocks of each other. There are also a few "fine-casual" restaurants dealing in Mediterranean, Italian, and modern fusion cuisine. University Village is a small residential and commercial area on University Boulevard on the eastern edge of campus, just before Pacific Spirit Park. The main bus route onto campus (including the 99 B-line) passes here. The development at the corner of University Boulevard and Allison Road is called University Marketplace . It has a full service Starbucks Coffee as well as a Blenz, Omio Japanese Restaurant, Pita Pit, McDonald's, and a number of smaller cafes. An underground food court has about nine Chinese, Japanese, Indian and Persian buffets, with lunch or dinner in the $5-$6 range. Dalhousie Road is the third side of this triangular area. The Student Union Building or "SUB" (6100 Student Union Blvd, across MacInnes Field from the main bus loop) has a number of food outlets run by the AMS (Alma Mater Student Society) offering pizza, bagels, sushi, and a deli. The highlight in the SUB is the cookies from Blue Chip Cookies. UBC Food Services also manages a number of foodcourt locations on campus, including in the SUB, two outlets of the Tim Hortons chain and a White Spot Triple O's (Main Mall & Agricultural Road). Staying in UBC tends to be quieter than some other spots in the city and the summer accommodation isn't bad value for what you get, but it is far from any attractions that aren't part of UBC. If you want to stay in the area, the university has a small hotel open year round and opens up some of the student residences during the summer. There is also a HI hostel near the beach in West Point Grey and some B&Bs. If you want to be close to both UBC and the other attractions, consider some of the options in Kitsilano and Vancouver South. This page was last edited on 3 August 2017, at 08:43.